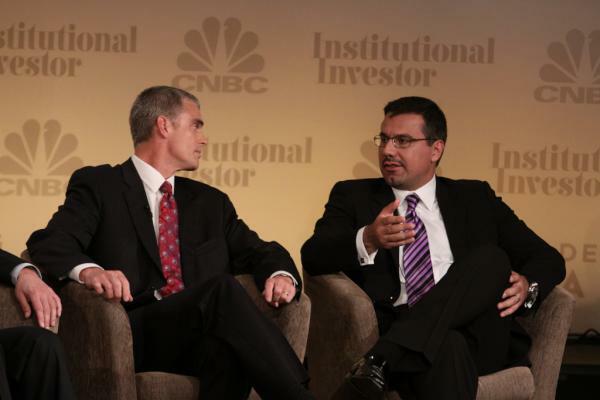 Continuing coverage from the Delivering Alpha conference today, we turn next to the commodities panel with Paul Touradji, founder of hedge fund Touradji Capital and Jeff Scott, CIO at Worts & Associates (both pictured left, image courtesy of CNBC). Paul Touradji was the 'commodities guru' at Julian Robertson's Tiger Management back in the day. Since then, he went on to found his own hedge fund, Touradji Capital. He kicked off the panel by saying that "the story of commodities going forward is in the emerging markets." Jeff Scott added that, "in emerging markets, they're lowering interest rates because they're worried about growth. So weak growth now in emerging markets so in theory commodities prices should fall." We've highlighted in the past how hedge fund Kleinheinz Capital thinks inflation is the biggest threat to emerging markets. It seems like a ton of hedge funds and investors in general own gold these days. Dan Loeb's Third Point has gold as its largest position. David Einhorn's Greenlight Capital has long owned physical gold. John Paulson even has a separate gold fund. Jeff Scott pointed out the prevailing sentiment toward the precious metal. He presented the audience with a true story about a taxi cab driver in Alaska that was asking him about gold. He said this means that everyone is piling into gold and it makes him nervous. After all, when the mania around any particular investment trickles down to the random 'John Doe' on the street, many see that as one of the age-old contrarian indicators. While Touradji is seemingly a long-term gold bull, he did agree by saying, "I'm heartened to hear Larry Fink's take on gold equities, $2,500 and a lot higher a year from now. But to put a price on it when it's in a phase like this, it's useless. I agree with (George) Soros that it will soon be in a bubble." They polled the audience asking whether gold was going higher or lower: 34% thought it was going lower while 33% said higher. Commodities are always affected whether there is an inflationary environment or a deflationary one. Jeff Scott said that, "at this point in time, you need to be thinking about deflationary and inflationary aspects in terms of angling your portfolio for the long-term." In the past we've posted up the best investments during inflation and the best investments during deflation. Paul Touradji went on to add that "Ten year TIPS are at zero. The market's worried about recession. But there also aren't rational people, they're acting out of fear and a flight to safety."